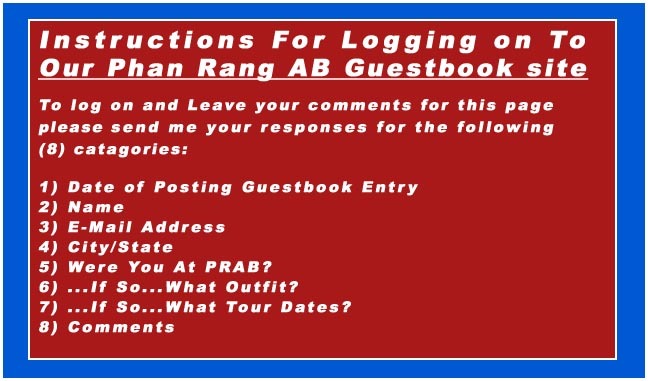 Select text below to leave guestbook information. with me at: sandaver7@yahoo.com, I would be greatly appreciative. lost contact with all but one of my friends while there. Prior to PRAB. I was stationed at Takhli AB in Thailand for 1 year (Oct 67 thru Oct 68). I am grateful for the opportunity serving in the AF and for all the friends I made. Comments: I was a Flight Line Assistant Crew Chief on the C-123 Providers. of shows cast....one of the most beautiful women I have ever seen. and went home. But, that was a year that I will never forget. now retired and living with my Thai wife in Thailand. Comments: I was in the 35th Air Police Panther Flt Squadron in 1966 and 1967.
base and bringing their Canberra Bomber. I remember the Koreans arriving also. so I said no thanks. Id like to hear from anyone who remembers me from my tour. Saudi Arabia, arriving just in time for Desert Shield and Desert Storm. Comments: My father has been trying to track down his old flight crew. Cortwright (possible misspelling of the last name) and Rick Steiner. Were You At PRAB: no, but my father was. Comments: My dad was SMSgt. Charles Ray Coker. He passed away in 1987 (age 57) from cancer. had known him that would be great. Thank you! Kevin. who remembers me or who served during my time there. Comments: My previous comments are in the archives. on the PM docks at the request of TSGT Roy Thomas. on active duty and now finishing my career in the reserves. in Korea and then a KC-135 pilot the rest of his career. after spending about a month in Phillipines for orientation. Northern South VM. Would hitch ride whenever OIC would allow. of LZ's were in mountain's and the bird never came to a stop. cargo out rear, close door and full power for take off roll. One sound caught everyone's attention, it was a metallic ping. wanted to go to PhanRang so we started out and radio went out. good inspection. Found a hole in lower wing to fuselage skin cover. Texas), Jack Evonka(? )(from Pa). Wish I could recall more names. Have lot's more memories but this is getting long so I will close. Click on Drive-In photo to return to my home page.